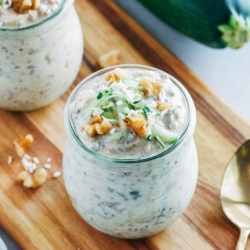 I know what you’re thinking…zucchini in overnight oats? That’s weird. Brandon thought the same thing at first but after he tried them he was pleasantly surprised. 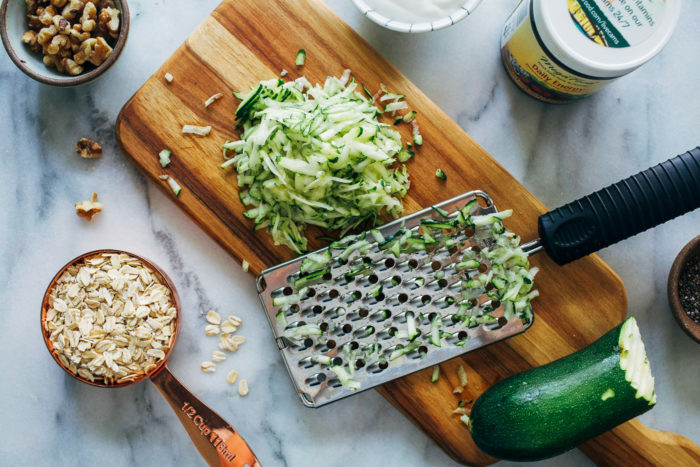 Mostly because you can’t even taste the zucchini. It blends right in with the flavor of the oats which are soaked in the goodness of cinnamon, yogurt and pure maple syrup. Talk about a great way to sneak in some green first thing in the morning! I also like to sneak in MegaFood® Daily Energy Nutrient Booster Powder™ for an extra pick-me-up in the morning. I’ve never been much of a coffee drinker but that doesn’t mean I bounce right out of bed ready to take on the day. 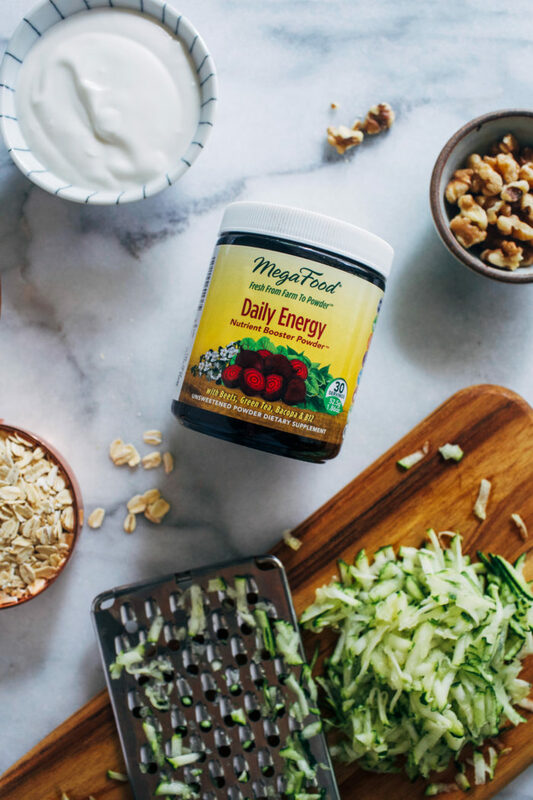 Sometimes I need a little kick in the pants and MegaFood® Daily Energy Nutrient Booster Powder™ always does the trick. A full scoop in a smoothie, fresh juice or overnight oats keeps me going throughout the day without feeling like I’m crashing mid-day. Formulated with FoodState® B12 and a potent blend of herbs and roots such as ashwagandha, eleuthero, beetroot, and green tea leaf extract; it’s specifically designed help sustain mental and physical stamina. * The powerful blend of adaptogenic herbs and roots also support the body’s physical and emotional performance under stress. 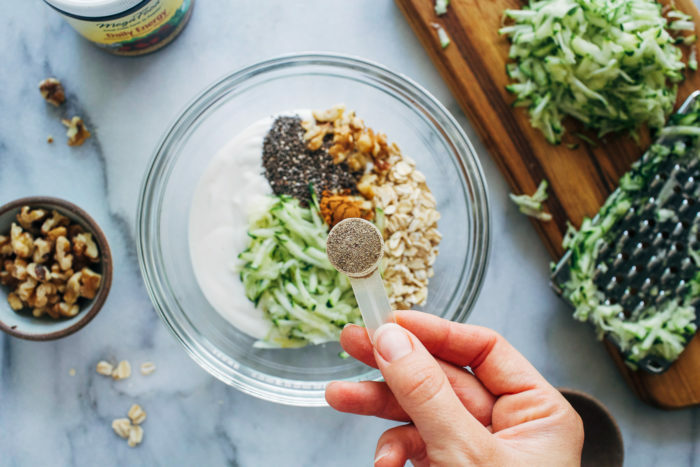 * Just like the zucchini, the flavor of the booster powder blends in with the oats seamlessly. 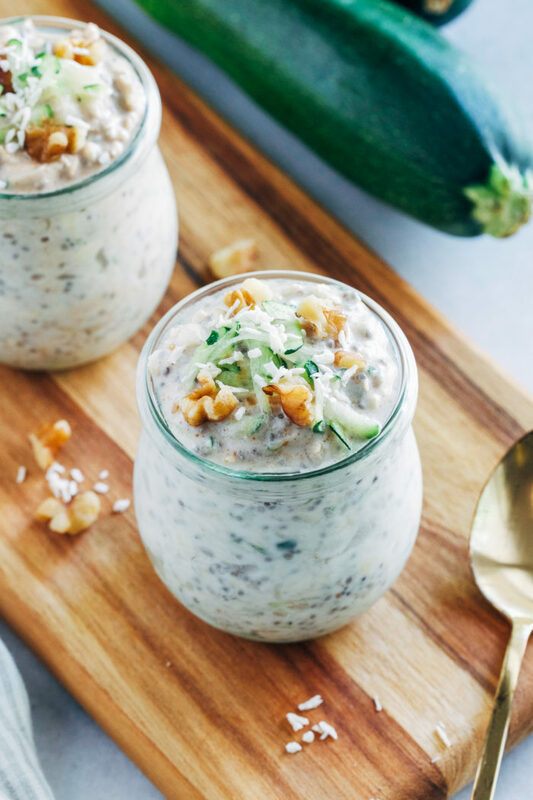 If you’re looking for a great way to use up all of that summer zucchini then I hope you’ll give these oats a try! 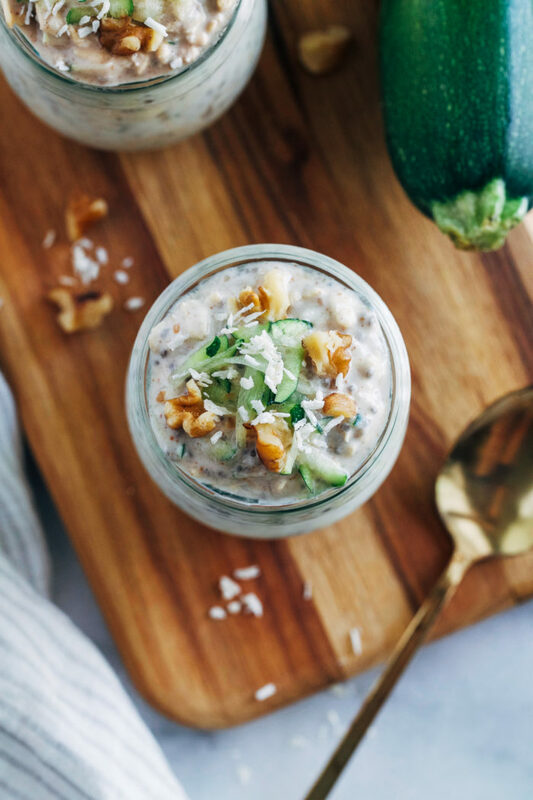 It’s the perfect light and healthy breakfast to prep ahead and help keep you energized all morning long. 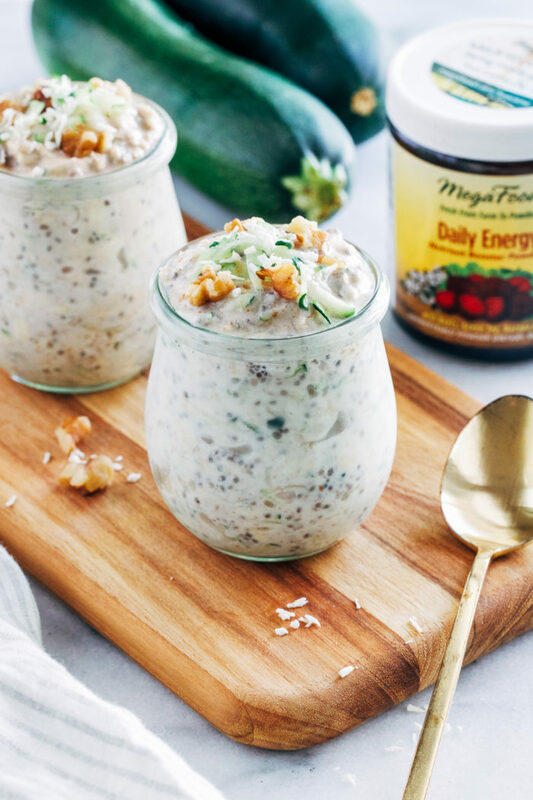 In a small bowl or jar, add the oats, chia seeds, yogurt, milk, shredded zucchini, walnuts, cinnamon, maple syrup, salt, and a scoop of MegaFood Daily Energy Nutrient Booster Powder. Stir together, cover tightly with a lid and refrigerate overnight. The next morning it will be ready to eat. If you prefer your oats warm, try microwaving them for 1 minute with a splash of milk. Top with sliced banana, shredded coconut, or any toppings you desire, and enjoy! **almond milk yogurt is my favorite but any kind will work.